These are some of the prettiest tacos I have ever made. I mean, tacos usually don’t win many beauty contests. They’re incredibly tasty, but the filling is mostly…well, limp. Or mushy. So if you’re a person who eats as much with your eyes, these are right up your alley. Thankfully, they taste even better than they look. 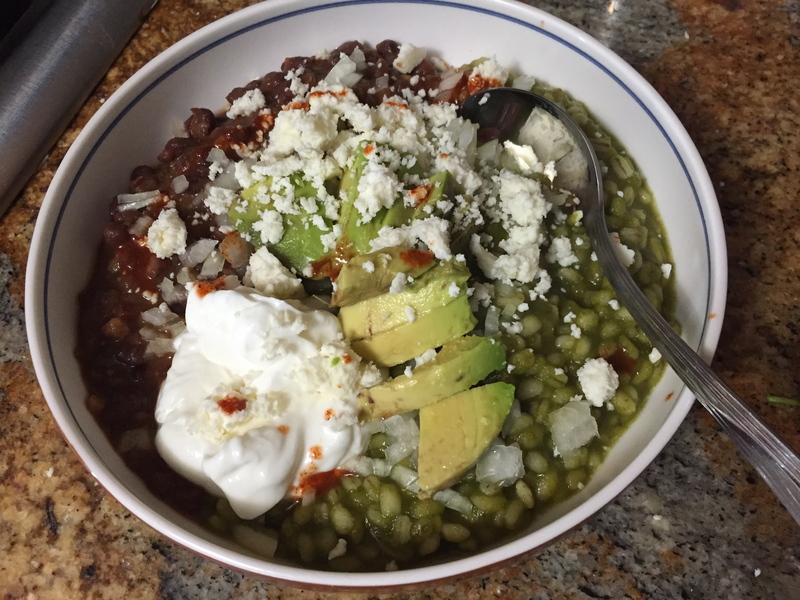 I was originally intrigued by the concept of peas in guacamole, but in hindsight, it’s the most natural combination. It has the creaminess, perfectly bright green color, and adds a slightly more verdant taste to the mix. The paneer – now, that was an inspired moment. 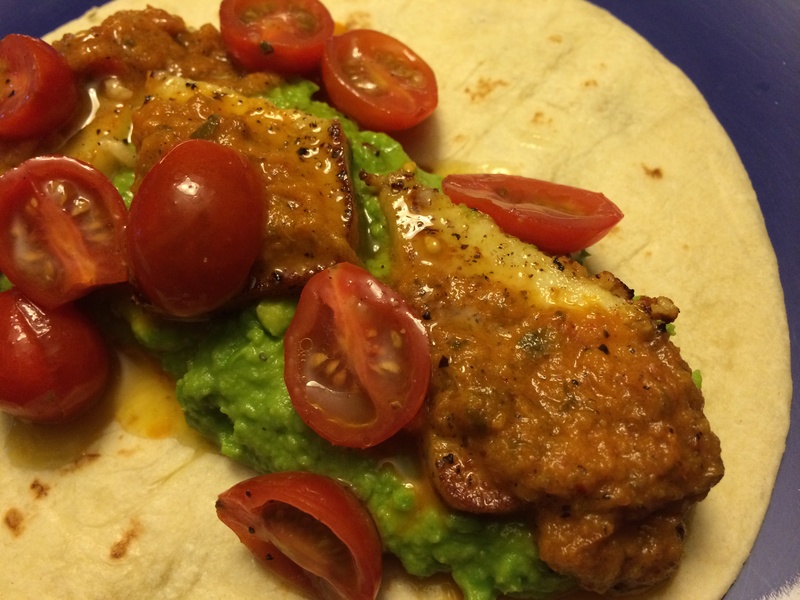 The original tacos in this recipe were fish (halibut to be exact), but halloumi cheese was suggested as a vegetarian substitute. My husband detests halloumi. In a way I’m not sure it’s possible to dislike a cheese. I did, however, have a block of paneer sitting in the fridge. And there was no looking back. These tacos offer the perfect combo texturally, with the cherry tomatoes offering the perfect juicy burst to the grilled paneer and pea guacamole. I also added a little spicy roasted salsa from my local favorite Mexican restaurant. Start to finish, the meal came together in 20 minutes. Can you ask for much more on a Monday night? Halve or quarter the tomatoes. Toss with the olive oil, garlic, and season with salt. Set aside to marinate while you prepare the remaining components. Bring a medium saucepan of salted water to boil. Add the peas and cook for a few minutes, until tender but still bright green. Drain the peas, and reserve about ¼ cup of the cooking water. Combine the peas, cooking water, cilantro, salt and pepper in a blender or food processor. Pulse until you have a slightly chunky puree. Add the avocado and lime juice and pulse again until well combined. Taste for seasoning. In a large skillet or nonstick pan, heat a thin layer of oil over medium high heat. Season the paneer slices with pepper on both sides, and fry for a couple of minutes on each side until lightly golden and crispy on the outside but still soft inside. Don’t fry too long, or the paneer will become rubbery. Now assemble your tacos. Heat the tortillas for about 30 seconds over an open flame on your stovetop until lightly charred. Put two heaping spoonfuls of guacamole on the tortillas, followed by a few paneer pieces, and some of the marinated cherry tomatoes. Spoon over some salsa and enjoy. This is one of those meals you pull out when you’re feeling a bit lah-dee-dah. You know, like I feel most days. Ha! In reality, I’ve been a tad distracted with all the nothing I’ve been doing. As in, seriously, nothing. Unless we count watching my son be spoiled silly by his grandparents as work. In which case, I’ve been working HARD. Either way, I’m so relaxed that the most taxing thing I’ve done this week is write this post. Thinking about roasting poblanos (heck, even thinking about turning on the oven) while sitting in this South Indian heat wave seems like insanity. But I’m mustering up my best effort, because I realise not everyone is here sweltering with me. And really, you must make this. Look, it’s blistered chilies. 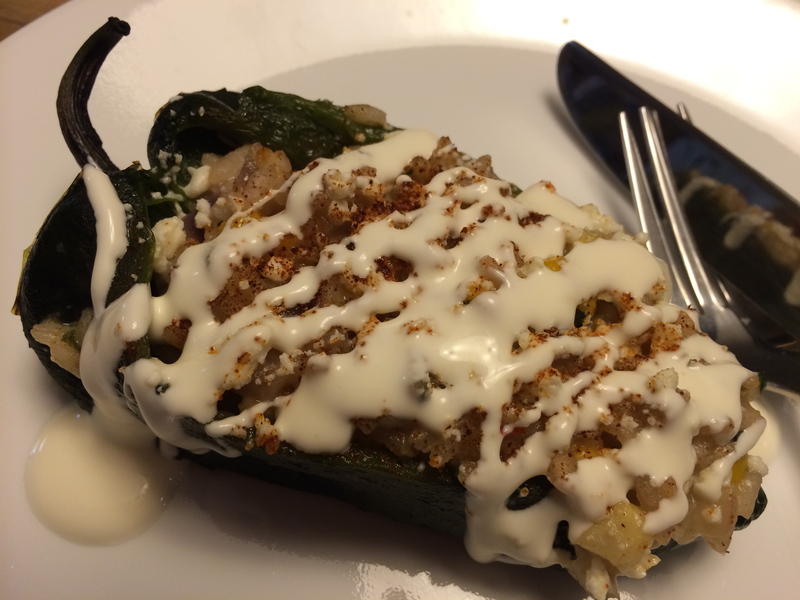 Stuffed with a Mexicanized corn risotto. Topped with a drizzle of lime cream. Must I go on? I must? Okay. 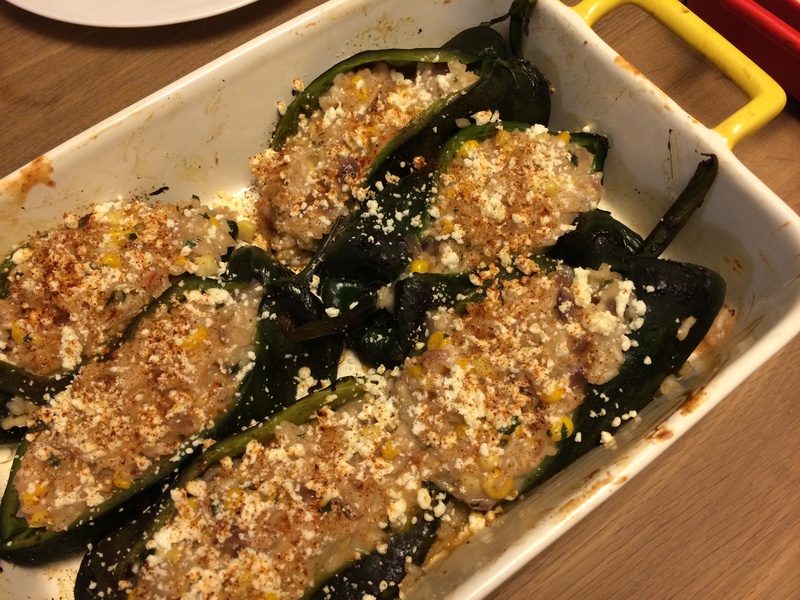 Think of this as Italian stuffed peppers that got a south of the border makeover. The smoky poblanos, for one. But also, a Mexican lager instead of wine (I know, it’s genius! ), pepper jack cheese instead of frou frou Parmesan, and cilantro standing in for parsley. If you need further convincing – although I can’t imagine why – know that the hardest part of this may be roasting the peppers. Although the components take a little time to come together, the actual effort involved is minimal. Sold? Off you go to the kitchen. Oh, and pass me that tall iced drink on your way, would you? I really can’t make it off this couch today. Place the peppers on each of your stove burners over a high flame. Use tongs to turn them over every minutes, until the peppers are charred and blistered all over. Place in a paper bag and seal tightly. Place aside while you prepare the risotto. To make the risotto, bring the stock to a simmer in a medium saucepan. In a large skillet, heat the olive oil over medium beat. Add the onion, green chili if using, garlic and salt to taste. Sauté until softened, 5-7 minutes. add the rice and cook 2-3 minutes until it’s lightly toasted and well coated in oil. Pour in the beer and simme until mostly evaporated. Ladle 1 cup warm stock into the rice mixture and simmer until it absorbs almost completely, stirring frequently. Add the remaining stock, 1/2 cup at a time, allowing each addition to be absorbed before adding the next. Stir often. The total cooking time should be 25-30 minutes. Along with the final addition of stock, add the corn and paprika. Though risotto is traditionally loose, this one should be thicker so it can be used to stuff the peppers. Remove the risotto from the heat and sir in the pepper jack cheese and cilantro. Taste and season if necessary. Now prepare the peppers. Gently rub off the skins and cut a slit lengthwise in each. Carefully scrape out the seeds and ribs (or leave some in for additional heat). 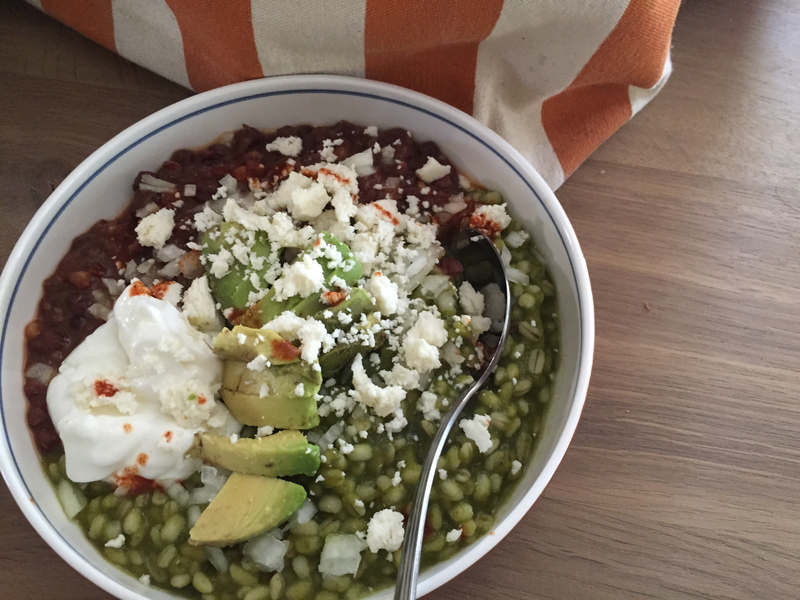 Fill each chili with risotto and arrange them in a single layer in a 13 by 9 inch baking dish. Sprinkle with queso fresco and bake 10-15 minutes until golden brown. Serve with a drizzle of the lime cream.